One of the premier destinations in Cary, North Carolina is the Umstead Hotel & Spa. 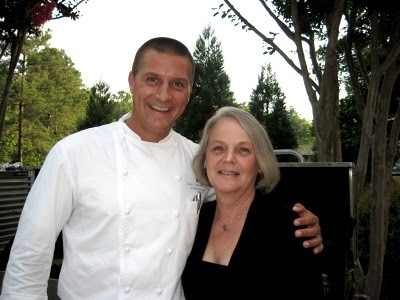 Its restaurant, Herons, is a five-diamond designated AAA establishment and Executive Chef Scott Crawford has been a three time semifinalist for a James Beard Award as best chef in the Southeast. We have been fortunate to eat at Herons on two occasions. The first time was three years ago at a wine and barbecue pairing dinner. I was fortunate to have the opportunity to talk with Chef Crawford and he was generous to the extreme by sending me some of his barbecue sauce recipes. You can find them on my blog post about the event here. 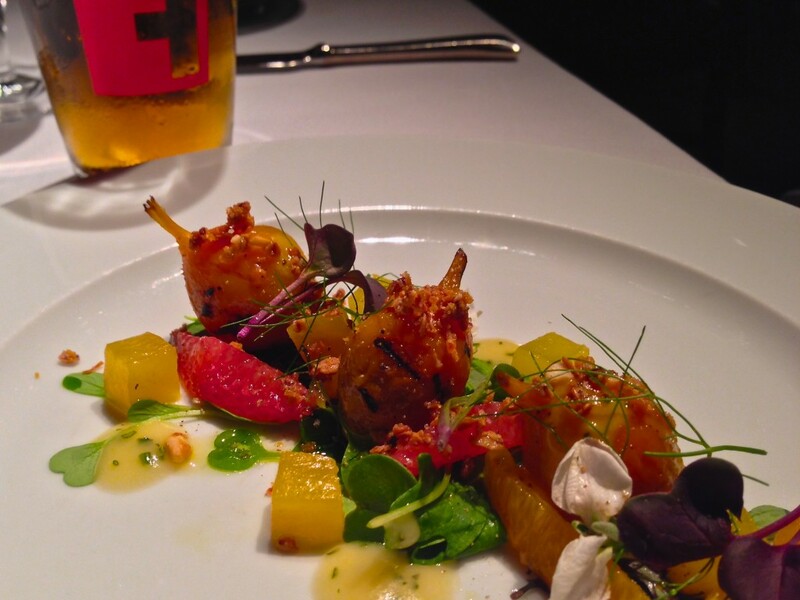 Earlier this month our Son and DIL treated us to a Beer Pairing dinner there for our birthdays. 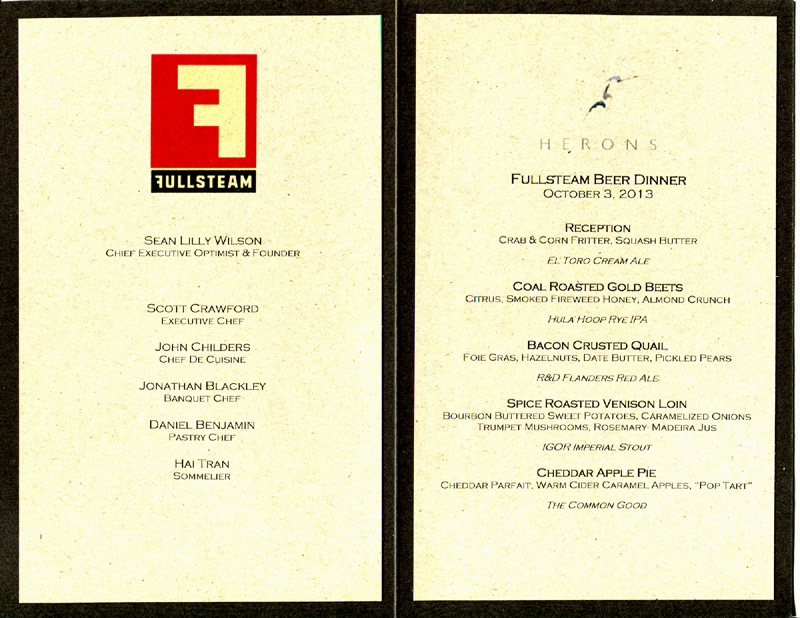 Chef Crawford joined up with Sean Lilly Wilson, Chief Executive Optimist and Founder of Fullsteam Brewery in Durham, NC. I was amused by this picture of Sean Wilson that appears on his website. All I can say is that the above picture of him looks nothing like the guy in the three-piece suit that entertained us the evening of the dinner. That night he looked like the successful businessman that he is. He is also a semifinalist for a James Beard award for Outstanding Wine, Spirtis or Beer Professional for 2013. Sean has worked very hard for the beer industry in North Carolina. He successfully lead the Pop the Cap campaign to change the State’s ABV cap from 6% to 15% alcohol content in 2005. Raising the ABV cap has resulted in the proliferation of local micro breweries with a craft beer mentality. In our area, Asheville has become a leader in the craft beer industry. But the Raleigh Durham Triangle area is also going strong. What I appreciate about Fullsteam Brewery in Durham is Sean’s philosophy of plow-to-pint production. He supports local agriculture by using barley, rye and other grains grown in North Carolina. Some of his beers even use locally grown apples and sweet potatoes. His enthusiasm is contagious and it was obvious that he and Chef Crawford had fun pairing his flavorful beers with the Chef’s delicious food. Here is the menu. The first course was a passed appetizer on the patio. It was Crab and Corn Fritters with Squash Butter and was served with Fullsteam’s El Toro Cream Ale. I did not get a picture of the appetizer but it was so good that I am going to try to duplicate it. The El Toro Ale is brewed with 100% NC barley and corn. This straw-colored beer is unpretentious and very drinkable. “A perfect beverage when you just want a beer.” It was also perfect with the corn fritter. The second course was Coal Roasted Gold Beets with citrus, smoked firewood honey and Almond Crunch. It was paired with Hula Hoop Rye IPA. Hula Hoop is a single hop rye brewed with NC rye, pungent apollo hops and crunchy granola. Apollo hops are strong with notes of grapefruit, orange, pine, resin, spice and cannabis. Do you see a pattern here? The pairing was perfect. 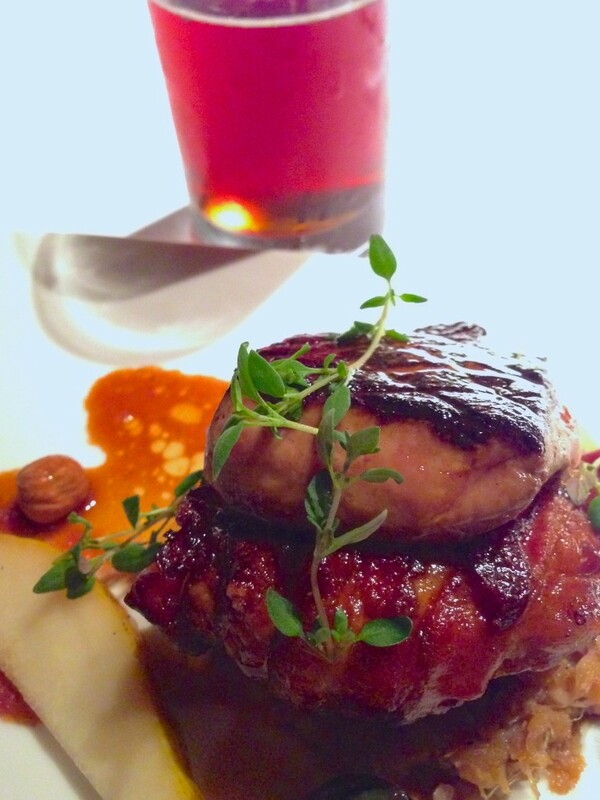 The third course was Bacon Crusted Quail with Foie Gras, Hazelnuts, Date Butter and Pickled Pears, paired with R&D Flanders Red Ale. Quoting Sean here about this beer, “the R&D Flanders Red Ale is a single batch of 10 gallons brewed on our home brew system. Kevin, one of our brewers, brewed the beer last year and it had been aging for about 18 months. It’s a sour ale with roeselare wild yeast and traditional beer ingredients; no curious Southern add ons. The wild yeast lends a wonderful acidity that refreshes the palette, standing up well to that decadent foie gras. A lighter beer would have gotten lost. A hoppy beer would have overwhelmed the palette. It was my favorite pairing of the evening.” I have to agree with him. Both the quail dish and the beer were brilliant. The Main Course was Spice Roasted Venison Loin with Bourbon Buttered Sweet Potatoes, Caramelized Onions, Trumpet Mushrooms and Rosemary Madeira Jus. This was paired with Fullsteam’s IGOR Imperial Stout. IGOR has a big aroma of roasted grains with overtones of dark fruit and coffee. It is aged in bourbon barrels for three months before being bottled. 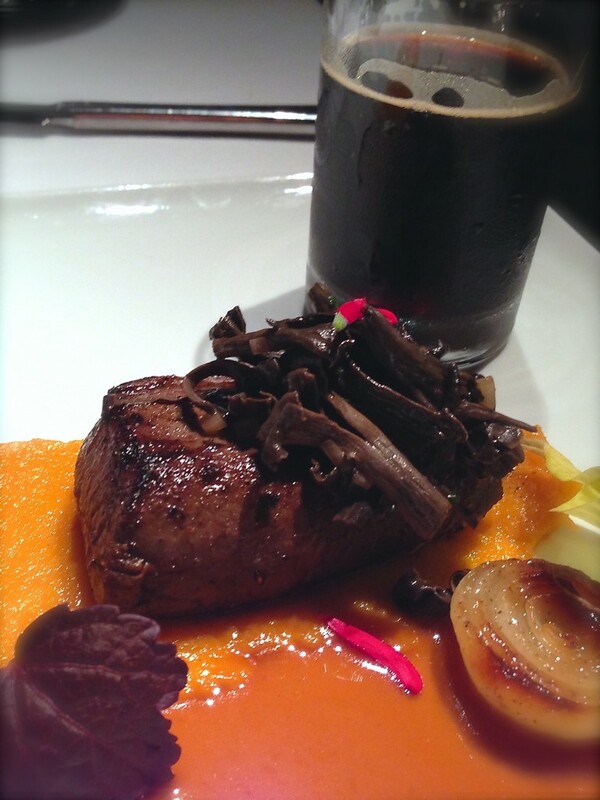 The big flavors of the meat and sweet potatoes paired well with this strong stout. We would like to try using this beer in Jamie Oliver’s recipe for Beef, Guinness, and Cheese Pie that I wrote a post about in 2011. It would be delicious. 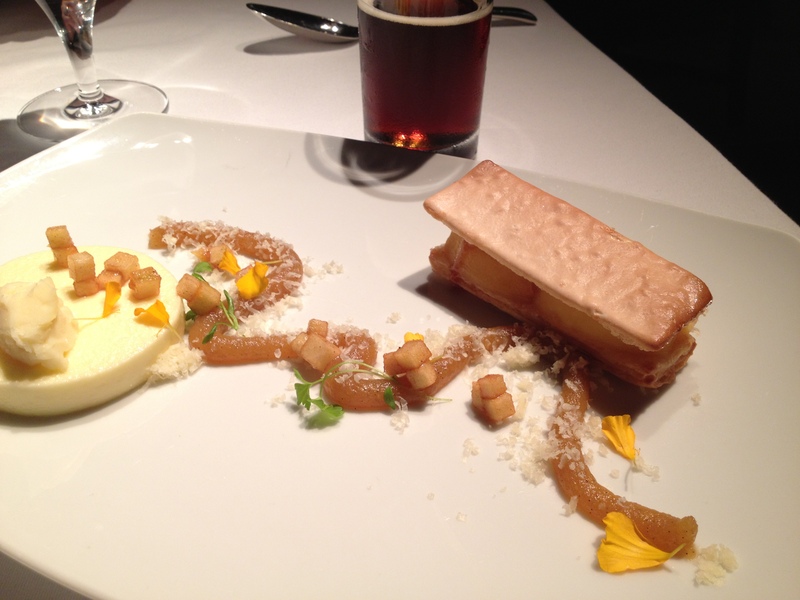 Dessert from pastry chef Daniel Benjamin, was called Cheddar Apple Pie. It consisted of a Cheddar Parfait, Warm Cider Caramel and an Apple Pop Tart. The crumbled cheddar on top of the parfait added just the right note to the whole dessert. It was not too sweet but totally complex in flavor. The dessert was paired with Fullsteam’s The Common Good. This beer is a combination of NC malted barley, corn grits and Pippen apples. There were wonderful overtones of cider here. The collaboration of Executive Chef Scott Crawford of Herons and Chief Executive Optimist of Fullsteam Brewery, Sean Lilly Wilson, was meant to be. 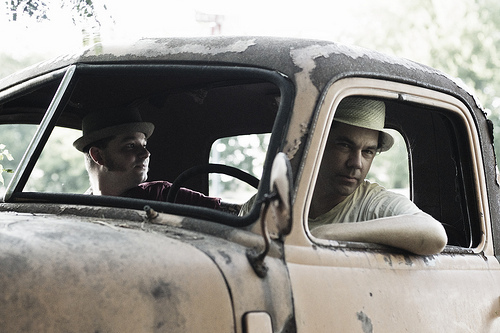 They both embrace the philosophy of the farm to table movement and execute their passions to perfection They should take this show on the road. Thank you both for a wonderful evening. Posted on October 13, 2013 at 1:13 pm. What perfect timing for Barefoot Blogger Thursday. Our Florida friends Maxine and Arnie just arrived for a visit and the lovely Veronica from Supermarket Serenade chose Mango Banana Daiquiris as the 1st Ina Garten recipe for the month of August. These drinks could not be simpler to make. Just dice up some mangos and bananas and throw them in a blender with simple syrup, lime juice, rum and crushed ice and you have a lovely tropical drink. They tasted great. Maxine loved hers, but I have to admit that I am not a big fan of fruity drinks. The guys thought they were “girly” drinks but I noticed they polished off the remains in the blender. 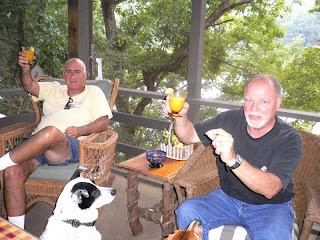 We enjoyed them on the porch as a prelude to dinner. Our dogs got into the action as well. Daisy never saw a snack she didn’t love. Their Laci is jusy visible. Thank you Veronica for choosing just the right thing for a hot day in August. Check out all of the Barefoot Bloggers to see their take on this drink and feel free to join us in cooking up all of the Barefoot Contessa’s recipes. 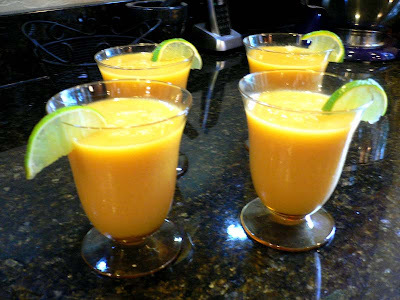 Place the mango, banana, lime juice, sugar syrup and rum in a blender and process until smooth. Add 2 cups of ice and process again until smooth and thick. Serve ice-cold in highball glasses with the mango slices. Posted on August 13, 2009 at 7:23 pm.